Also having a rough start to the week is anyone with a long stock position or a cryptocurrency portfolio. The Dow Jones closed down over 1,200 points today, building off of Friday’s plunge of 666 points. The relentless ascension of stock prices has suddenly jolted into reverse, delivering the biggest 2-day drop stocks have seen in years. But that’s nothing compared to the bloodletting we’re seeing in the cryptocurrency space. The price of Bitcoin just broke below $7,000 moments ago, now nearly two-thirds lower from its $19,500 high reached in mid-December. Other coins, like Ripple, are seeing losses of closer to 80% over the same time period. That’s a tremendous amount of carnage in such a short window of time. And while stocks and cryptos are very different asset classes, the underlying force driving their price corrections is the same — a change in sentiment. Both markets had entered bubble territory (stocks much longer ago than the cryptos), and once they did, their continued price action became dependent on sentiment much more so than any underlying fundaments. History is quite clear on how bubble markets behave. On the way up, a virtuous cycle is created where quick, outsized gains become the rationale that attracts more capital into the market, driving prices up further and even faster. 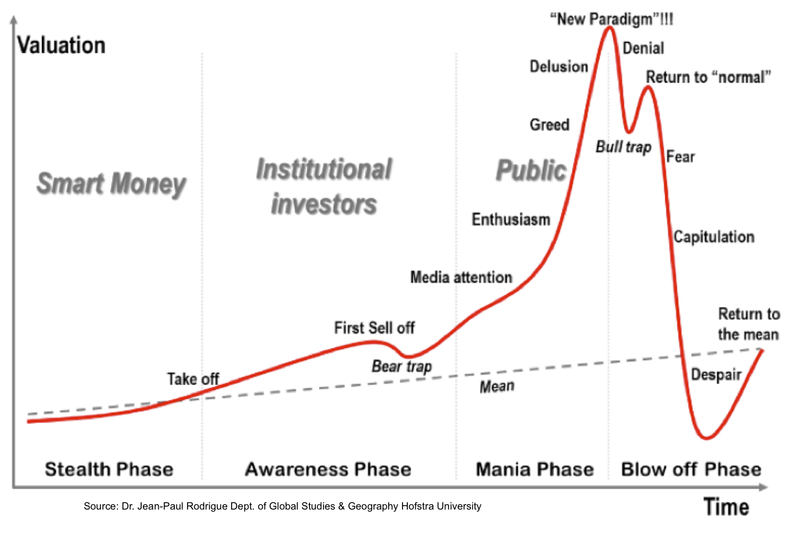 A mania ensues where everyone who missed out on the earlier gains jumps in to buy regardless of the price, desperate not to be left behind (this is called fear of missing out, or “FOMO”). This mania produces a last, magnificent spike in price — called a “blow-off” top — which is then immediately followed by an equally sharp reversal. The reversal occurs because there are simply no remaining new desperate investors left to sell to. The marginal buyer has suddenly switched from the “greater fool” to the increasingly cautious investor. Those sitting on early gains and looking to cash out near the top start selling. They don’t mind dropping the price a bit to get out. So the price continues downwards, spooking more and more folks to start selling what they have. Suddenly, the virtuous cycle that drove prices to their zenith has now metastasized into a vicious cycle of selling, driving prices lower and lower as panicking investors give up on their dreams of easy riches and increasingly scramble to limit their mounting losses. In the end, the market price retraces nearly all of the gains made, leaving a small cadre of now-rich early investors who managed to get out near the top, and a large despondent pool of ‘everyone else’.